So. many. holiday events. Get festive with Shop Durham. Plus, get $5 off 2 Shop Durham cards using code LOCALLOVE. The Durham Symphony Orchestra is celebrating with their Annual Holiday Pops Concert and Silent Auction Fundraiser at the Durham Armory. It will feature Hanukkah, Christmas, Kwanzaa, and New Year’s music. Proceeds from the event will help the DSO fund its 2018-19 performances and its educational and community outreach efforts during the year. You know it’s officially the holiday season when the lucky strike tower is all lit up. It’s a fun celebration with choral groups, and yep, even Santa. Be one of the first 1,000 people on site and receive a Light Wand. Head to Parkwood’s WinterFest for food trucks, beer and hot beverages, bounce houses, and a craft market. All families and friends are welcome, in and outside the Parkwood Neighborhood! Yep, and Santa himself will be there. The Patchwork Market is a monthly markers market showcasing local artists and makers. We love their larger seasonal events at the Armory so we can get all our shopping done in one spot. This year it will span 2 days and feature over 100 local vendors. Check out our guide to Patchwork market and the vendors to watch for. Join 25+ of your favorite movers and shakers of Durham for the Golden Belt Grand Opening Party! On December 1st come out and experience art, music, food, and local brews from Hi-Wire Brewing! 3pm-6pm will be kid-friendy, so bring your entire family out to celebrate with the Bull City community! Every year, The Duke Chorale puts on its Christmas Concert at Duke Chapel. There’s always traditional carols for the entire audience to sing and stories and special treats for the children. *Pre-concert music on the carillon begins at 6:30 PM. Admission is simply 1 non-perishable food item for needy families in Durham. Check out floats, hometown bands, schools, and more on Main Street at the Durham Holiday Parade. Then Fun Fest is jam packed with snow sledding, pony rides, bounce houses, visits with Santa, train rides, and music. This event is free. You can really nerd out at GeekCraft Expo. There’s geeky, super-fun make-n-take crafting activities for kids & families…free of charge! Admission is free, just make sure to register beforehand otherwise there is a small fee at the door. Check out other holiday markets happening in Durham this month here. Gather your family together at the Winter Wonderland Festival to celebrate the season with winter-inspired crafts, storytelling, cookie decorating and cultural activities from around the world. Enjoy sweet treats and festive music with Snowdrop, the Gardens’ snowperson. Bring your pups out to meet Santa and get a photo! There will also be a ugly sweater contest, holiday pet market, and canine food drive. Celebrate Christmas by Candlelight at Duke Homestead. Costumed interpreters will lead you on a candlelit tour through the Historic Area festooned with period decorations from the 1870s. Enjoy traditional story telling, hot cider, and cookies. Tickets are $6 for adults and $3 for kids 1-10. 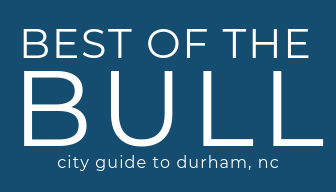 Best of the Bull and Shop Durham are hosting our first holiday market and we’re featuring an amazing line up of Shop Durham local makers and shops! The new 2019 Shop Durham cards will be available and all participating vendors offer a Shop Durham discount or reward! Come get your local shopping done in one spot and grab a beer from Durty Bull Brewing. The Shop Durham card gets you discounts, rewards, and freebies at over 180 locally owned Durham businesses like Cocoa Cinnamon, Kaffeinate, LocoPops, and more. See how Christmas was celebrated during the American Civil War. There will be cooking demonstrations in the kitchen house, Christmas decorations in the main house, soldiers will demonstrate Christmas in the field and of course, a visit with Ole St. Nick. Grab some complimentary hot apple cider or some sweet treats from the bake sale. Visit later on in the evening for a Christmas by Candlelight Tour. Eastcut’s Oyster Saturday will get even more interesting on Saturday 12/15, as Ponysaurus Brewing joins the festivities pouring their Oyster Saison! Warm up in their heated Garden from 2pm for oysters, beer, and live music! Kwanzaa itself is a seven-day African holiday that celebrates a different principle each day. AADE’s Kwanzaa takes place on the seventh day, which is dedicated to Imani, or faith. Kwanzaa Fest is FREE and open to the public! Come enjoy games, arts & crafts, a drumming class, and Durham’s Fire Department at the Children’s Village. In honor of Baba Chuck Davis donated items will be given to Urban Ministries of Durham.